The humble but ever so tasty hummus is delicious, healthy and so easy to make. I wonder if you have ever tried hummus warm? 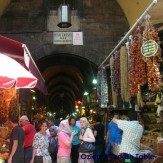 In Turkey, especially in the South, hummus is served warm with red pepper flakes infused olive oil or with some sautéed pastirma (similar to pastrami; dried cured beef coated with spices) over the top. I’d very much encourage you to try hummus this way, as I feel you may be pleasantly surprised, and maybe converted to eat hummus warm as many of my friends have done. Please adjust the hummus recipe according to your taste, as some like it garlicky, some with more tahini and others may prefer it more lemony. You can get tahini, the crushed sesame seeds in paste, in most supermarkets these days and Middle Eastern stores. This warm hummus would make a wonderful appetizer to share with friends and family. It also complements any grilled meat or vegetable beautifully. Pita bread is the perfect accompaniment. If using dried chickpeas, drain the chickpeas and transfer them to a pan with plenty of cold water. Bring to boil and boil for a few minutes. Then lower the heat and partially cover the pan, Simmer the chickpeas for 1 hour, until they are soft and easy to mash. If precooked chickpeas are used, drain the juice and give them a little wash in a colander. 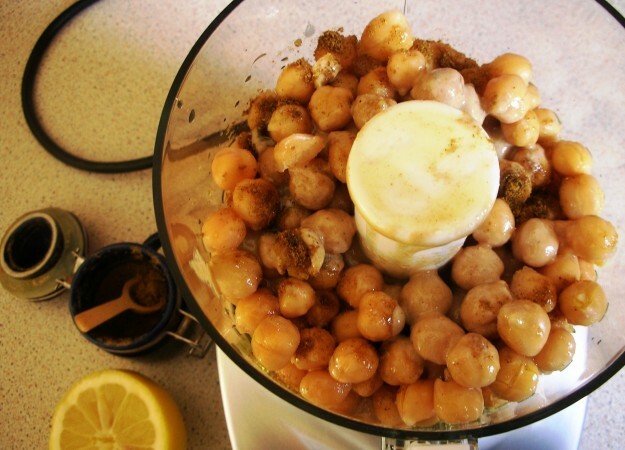 Put the precooked (or cooked) chickpeas in a food processor and blitz them together with the extra virgin olive oil, water, lemon juice, garlic and tahini. If it appears thick and difficult to blend, add a little more olive oil or water. Season with salt and mix in the cumin. Process until you achieve a soft, smooth paste. Refrigerate until required. If you would like to have the hummus warm as in the Turkish way, just before serving, warm this mixture in a pan for a couple of minutes. In a separate pan, heat the olive oil gently and stir in the red pepper flakes. Combine for a minute or two and let the red pepper flakes infuse to the olive oil. 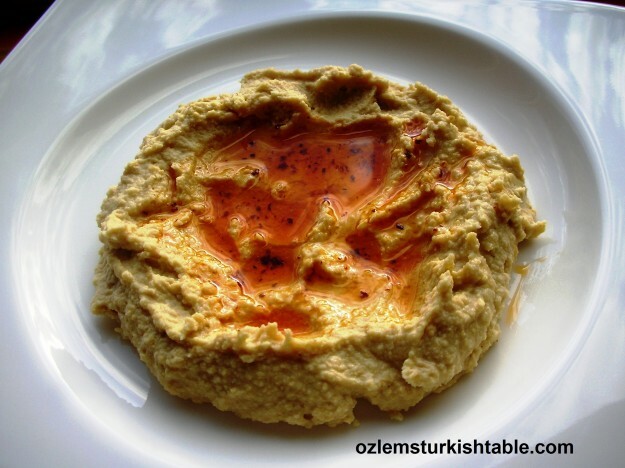 Put the warm hummus in a plate and drizzle the red pepper flakes infused olive oil over the top. You may sprinkle some extra ground cumin over the top, if you like. Serve with pita bread. 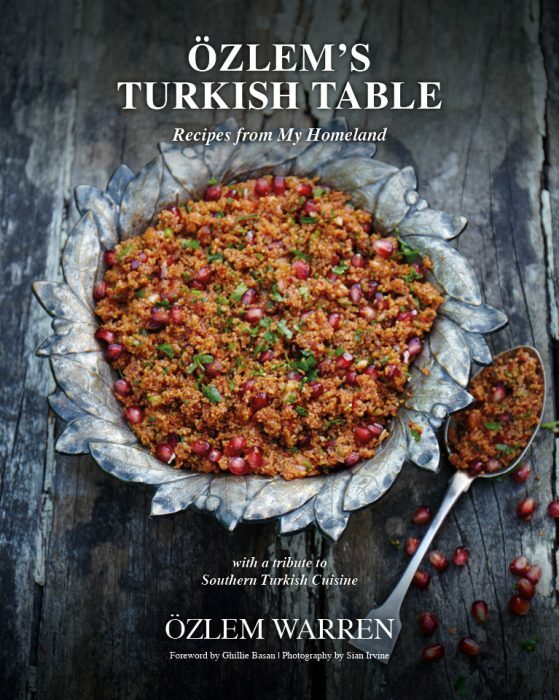 Delicious and healthy Turkish mezes, dips, salads, vegetables cooked in olive oil, savoury pastries and over 90 authentic Turkish recipes are included at my cookery book, Ozlem’s Turkish Table; signed copies can be ordered at this link and delivered worldwide, promptly. Here you can make your online order . You can order extra virgin olive oil samples or EXW, FOB and CIF prices. You can choose which package tou need Tin can, glass bottle, 5 liter, 3 liter, 1 liter, 750ml, 500ml 250ml, your quantity and your country you want to receive. Place your order easy, fast and reliable! 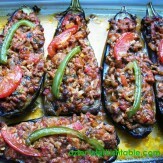 We just last week had some stuffed wine leaves like these in Cunda and they were delicious! As was the freshest ever fish we ate there. 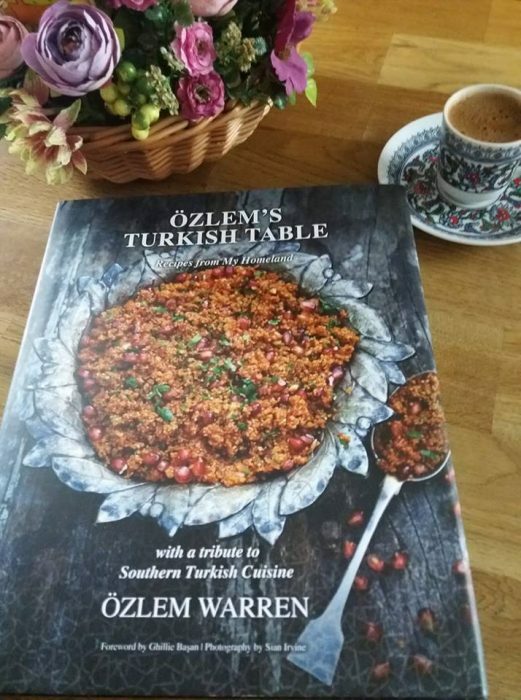 Lovely memories of your beautiful country, Özlem! I fell in love with hummus and simit while in Turkey and after reading these recipies on your blog I am excited to try them. 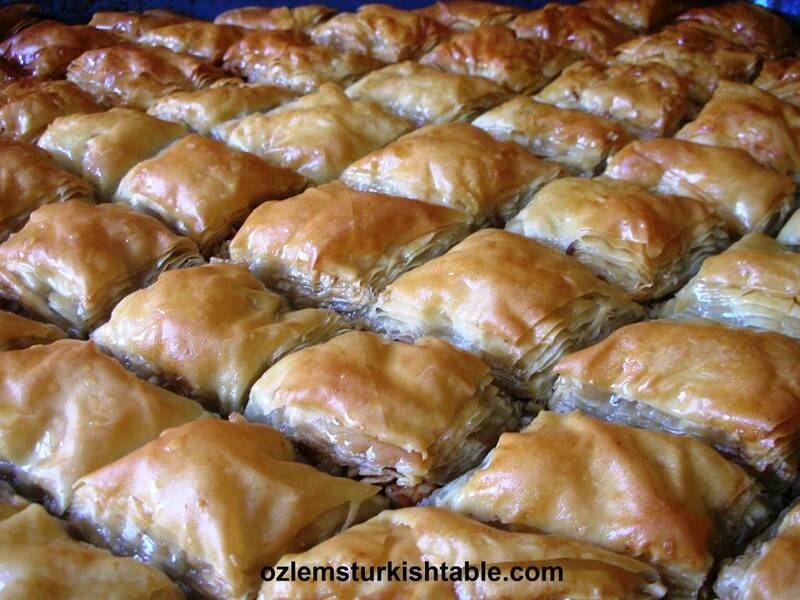 They will take me back to your wonderful Istanbul with each bite. Merhaba from Istanbul, Ozlem! I have to admit that I’ve only made hummus a handful of times at home. I often buy it at my meze shop and then jazz it up a bit at home with either some roasted garlic, paprika or roasted red peppers. Thanks for stopping by; I don’t blame you, the hummus, mezes are so good at home that they are very tempting. I liked the idea of jazzing them up with especially roasted red peppers – thanks for that! Many thanks, very kind of you. It’s a joy to share food and connect with food lovers. 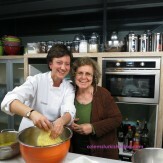 Many thanks for your visit Jane, very kind of you! I love seeing simiarities and variations in our cuisines, and it is wonderful to share food; hope you enjoy the blog; look forward to your posts! I was trying to share this recipe and someone has hacked it with spam about viagra. The recipe is fine but they make it look like you wrote a message about viagra etc. I didn’t know what to do so I cancelled and now I’m letting you know.